he Battle of Poitiers, fought by the English and the French, took place on the 19th of September, 1356. The English were led by Edward of Woodstock, the Black Prince, and the French were led by the King John II of France. The battle took place a few miles to the south east of Poitiers in France. The Black Prince was the son of Edward III, King of England and was heir to the English throne. During 1355 and 1356 the Black Prince was engaged in a Chevauchée in France. Chevauchée was a medieval term for a process destroying the towns, villages and land of an enemy lord in an attempt to reduce the wealth that the lord could extract and put to use in going to war. It also caused panic in the local population and an exodus of refugees. The location of the battle was just to south east of the town of Poitiers. King John was to the north coming down the road from Poitiers and Edward positioned his army on high ground just to north east of the village and Benedictine Abbey at Nouaillé. The surrounding area consisted of a series of gullies. The River Moisson formed the south western edge of the battle field. 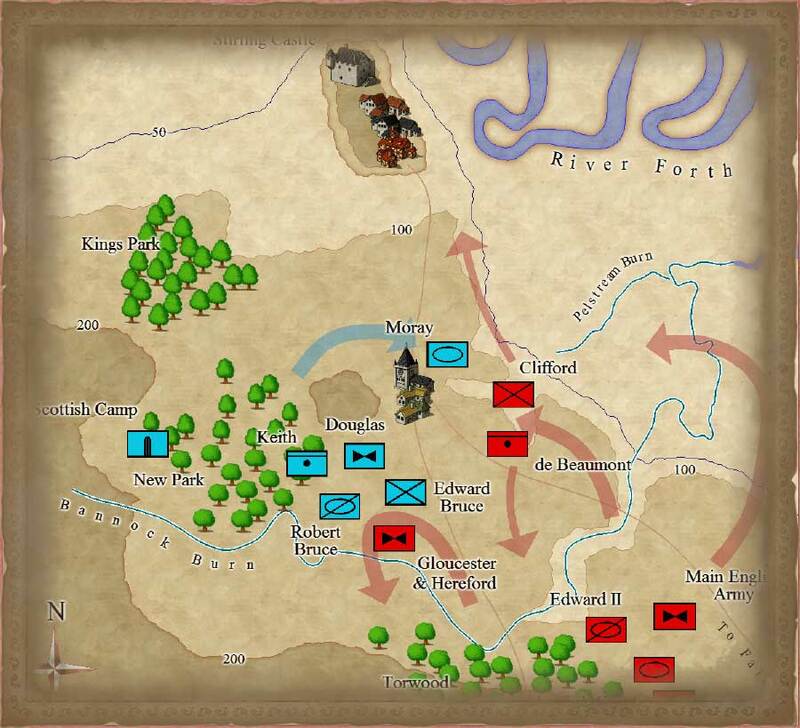 The armies set up their positions on the 17th of September, a Saturday. On the Sunday a representative of the Pope tried to get the two sides to agree a truce. The English were happy to have this extra time to dig trenches and fortify their positions. Edward's forces were outnumbered but the Prince chose his position on high ground surrounded by hedges. A hedge-lined track led towards the French lines so any French attack would have come down the narrow lane. Edward positioned archers along the lane. Edward, the Black Prince , was the eldest son of King Edward III or England. The Black Prince was heir to the English throne. Thomas Beauchamp, Earl of Warwick and William Montague, the Earl of Salisbury . Also on the side of the English was Jean III de Grailly, the Captal de Buch. Captal de Buch was a title he held in Gascony. He was an important supporter of the English against the French in during the Hundred Years War. King John II, the Good, of France . John had become king in 1350 after the death of his father, King Philippe VI. The Dauphin Prince Charles , King John's eldst son and the future King Charles of France. Philip, the Duke of Orleans who was the King's brother. Jean de Clermont and Arnoul d'Audrehem . A truce was never going to be agreed and the battle began on Monday 19th September. The first engagement involved the two Franch marshals Clermont and Audrehem. They charged towards the front line of the English on horseback. The English archers shot at them from the protection ofd the hedgerows and killed many Franch horses and men. The attack was reduced to chaos and the surviving French knights turned and retreated. In this attack Clermont was killed and the Duke of Audrehem was captured. Behind them the second line of the French army was still moving forward under the control of the Dauphin. When the two armies met the fighting was fierce but the English lines held and the French were beaten back. 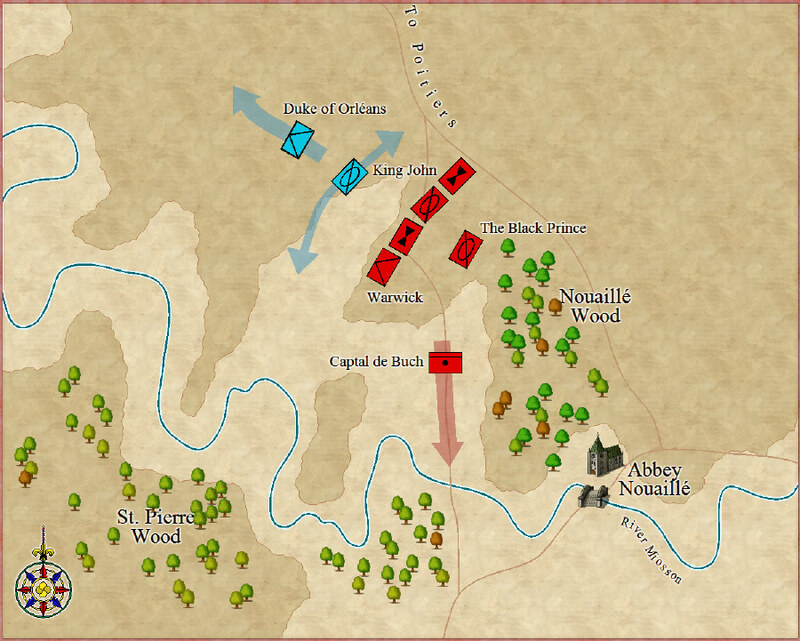 It was at this point that the knights under the command of the Duke of Orléans turned and left the battle field. Was this a retreat or was it a ploy to get the English to follow and break their ranks. Whichever it was the English held their positions. They used a lull in the fighting to regroup and discard blunted and damaged weapons, replacing them with better ones from fallen enemies. Arrows were pulled from the dead to be used again. It was now the turn for the French King to advance on the English lines. His army was larger than the army the English had begun the battle with and they were all rested and fresh. 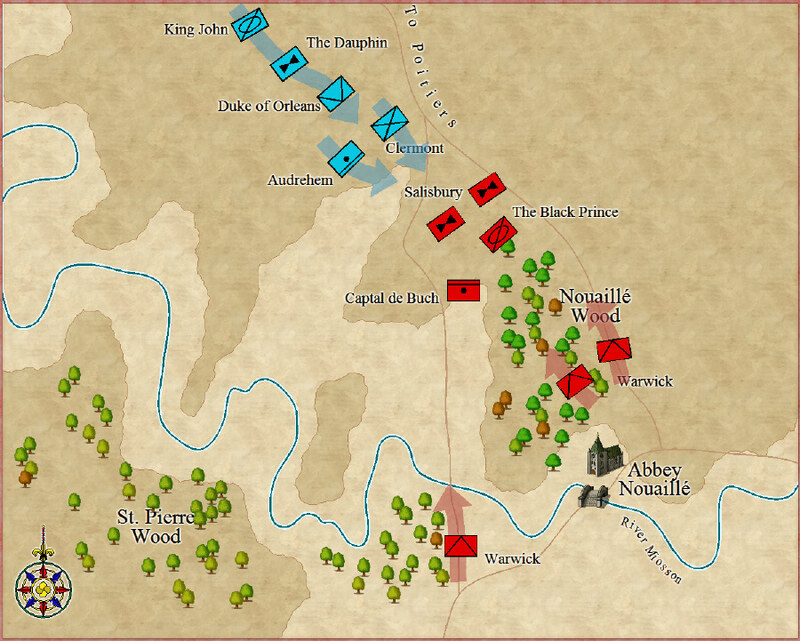 The French army being much bigger threatened to outflank the English army on the side of the river. The Black Prince and Earl of Warwick sent reinforcements to the front line to counter the threat.The Black Prince also had a secret weapon. On his side was a force of horsemen commanded by the Captal de Buch, Jean III de Grailly. The Prince sent him off the battle field through the woods to reappear to the rear of King John's army. Although they were outnumbered the English were able to defeat the French with charges of English knights on horseback. 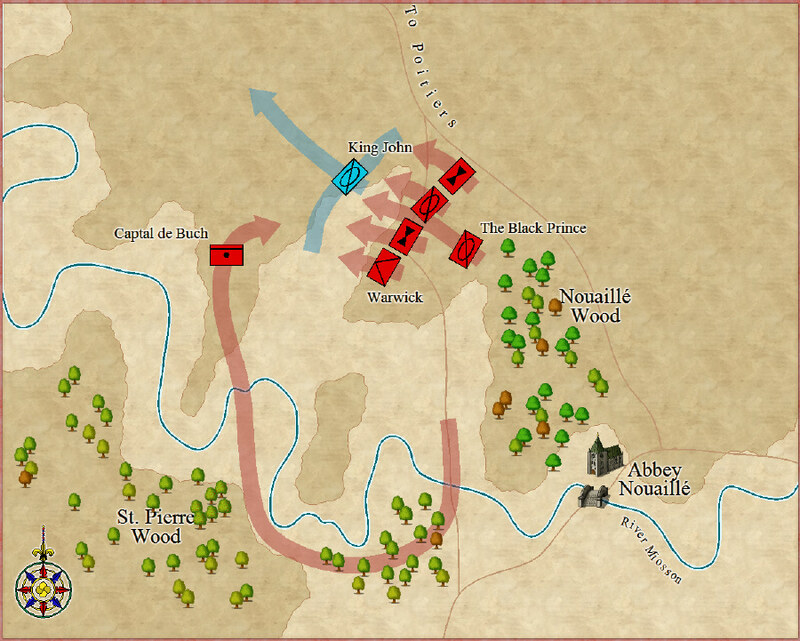 With the added effect of the Captal de Buch suddenly appearing at the rear of the French lines the French were defeated and fled back towards Poitiers with the English in persuit. But the gates to the city were held closed by the inhabitants and the French had nowhere to hide. Many were slain outside the city gates. The French king was not killed but captured. The battle was over.